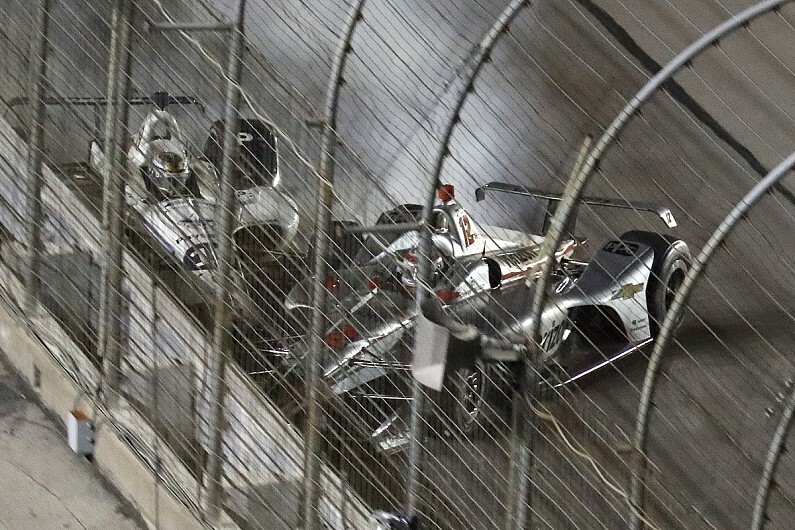 Penske’s Will Power says a breakdown in communication with his spotter was the cause of his crash with Dale Coyne Racing’s Zachary Claman de Melo in the Texas IndyCar race. Power had qualified third in a Penske 1-2-3 led by Josef Newgarden and Simon Pagenaud and the trio had held the early edge in the race. But a combination of Penske’s troubles with tyre blistering and a stronger performance from the Honda engines, primarily due to better fuel mileage compared to Chevrolet power, brought Power back into the mid-pack. Last-row starter De Melo then tried a pass around the outside for sixth on lap 205 of 243, but Power moved higher up the lane and made contact with the DCR driver – forcing both into retirement. “The guys in front of me were saving a lot of fuel and completely lifting to try and make it and someone went around on the outside,” said Power. “Unfortunately, the timing stand was talking to me at that exact moment and I couldn’t hear my spotter call ‘outside,’ and there was someone outside at that point. “It’s just a bad situation, but something that happens at a track like this. It was not the guy on the outside’s fault. De Melo says it was “clear” he was on the outside of Power but did not blame the Penske driver. The DCR rookie was criticised by several drivers, most notably Robert Wickens, for his driving conduct in the Texas race. “I got a great run on the outside in clean air, I probably would have passed Power, as well,” de Melo said. “I don’t know if his spotter didn’t tell him I was there. “Watching the replay, I was clearly there. It’s just one of those moments. I’m sure he didn’t do it on purpose. “I feel bad for him and I feel bad for me and the team. It’s a bad day, but I think I showed my potential. It was a great run up until that point.